"…any individual can become innovative if he or she practices the process of innovation….The challenge is in accepting that everyone can be innovative and produce innovative solutions on demand." Vern Burkhardt (VB): Business Innovation was an ambitious project. Did you initially set out to write a comprehensive treatise or did it evolve as you progressed with your research? Praveen Gupta: One of my commitments to myself has been to not do a job if I am bored or if I am not learning. Inspired by the success of many dotcom businesses during the mid 1990s, I launched a dotcom business in 1999 but it was closed by 2000. My dotcom failed in a business sense but it enriched my knowledge in many other ways. While trying to recover from the shock of this failure and exploring what else I could do, I decided to return to my core competency of management consulting. Having the privilege to work with the inventor of Six Sigma, the late Bill Smith, I reflected on Six Sigma as originally intended and began improving the Six Sigma process applying the theory of constraints principles. I discovered that to be successful in any venture, innovative thinking was a critical ingredient. This led me to develop a breakthrough innovation process. Being an entrepreneur I wanted to develop the most comprehensive approach in order to offer a significant impact to my clients. I suppose it must have been my calling. Besides, I wanted to develop and document the process such that innovation skills could be taught to anyone. I truly believe that innovation is a prerequisite to successful entrepreneurship. Unfortunately, most colleges and organizations teach only entrepreneurship without imparting any skills in innovation. I have been teaching the "Business Innovation" course at Illinois Institute of Technology (IIT) in Chicago. Fortunately other universities and junior colleges are becoming interested in offering a course on innovation. After completing my framework for the innovation process, I still had to develop a theory of innovation to understand differences among various innovation methodologies. Being a follower of Einstein, I visited Einstein's Exhibits at the Museum of Science in Boston, Massachusetts in 2005. There I realized that innovation is the conversion of intellectual energy into ideas, ideas into action, and action into innovative solutions. Learning about the interaction between human brain and the innovation process, and working with people have also had a significant impact on my personal life. Because of this new understanding life continues to become more enjoyable and peaceful. VB: You mentioned you spent time with the late Bill Smith. What was he like as an individual? Praveen Gupta: Bill Smith was very open-minded and humorous; he was having fun doing what he was doing. I enjoyed my experiences working with him. At one point I was developing a Four Sigma process in Austin, Texas and he was developing Six Sigma. When I moved to Chicago, I joined his team rather than trying to assert myself, because I saw that most of what we were doing was similar. His approach was more practical; mine more theoretical. I changed to his side of the story, and enjoyed working on Six Sigma processes. The best part of Six Sigma, which is misunderstood today, is setting very aggressive goals. It is aggressive to the extent that it forces you to think differently. You have to be creative in order for Six Sigma processes to work. It wasn't mainly a statistical approach. A lot of people have made Six Sigma more mechanical with a focus on the use of statistics, but it was creative thinking that made Six Sigma successful and can continue to help companies be successful today. Two months ago I organized the world's largest Six Sigma class for ‘Greenbelt Training' with 150 participants. Bill Smith's wife, Betty Smith, addressed the crowd and people loved it. A lot of companies have benefited from Bill Smith's work. VB: You say, after reading many books and researching materials on the Internet, you concluded that a formal process for innovation did not exist. Did this surprise you given the large amount of focus on this topic in recent years? Praveen Gupta: I have been researching various innovation methodologies over the years. I have also read books by authors you have already interviewed, including Michael Gelb and Tom Kelly. I concluded that there was no widely accepted framework, methodology, or science of innovation. Everyone has been making their own rules of innovation. Being an engineer, my dilemma was how to learn to use these methods. When analyzing innovation-related courses taught in various universities, I noticed that most ended at the brainstorming stage. And this stage has proven to only be about 30% effective. Given the low success rate in the range of 5 to 10 percent for R&D, venture funding processes, mergers and acquisitions, and strategy execution, I was not surprised that there has been a dearth of an effective approach to innovation. I saw this as an opportunity, so I grabbed it by the horns and pursued it to the fullest. Tom Kelly's book, The Art of Innovation, inspired me to explore and develop the science of innovation. I believed that one IDEO organization would not satisfy the needs of the global economy. I wanted to bring out the beauty and hidden creativity of every mind in the world. VB: You caution that case studies in published books can be misleading, because following those companies' innovation methodologies is likely to lead to making the same mistakes they made and prevent new innovative thinking. Given this, why do so many authors use case studies to illustrate their key points? Praveen Gupta: We all love examples and case studies in order to learn from other people's successes or mistakes. However, I have been told by leading universities and people who have participated in developing case studies that often the written case study and what actually happened in reality are two entirely different things. Besides, we can always find a case for any business model if we look hard enough, but that doesn't make the methodology universally applicable. Teaching innovation means teaching productive thinking, not reproductive thinking through case studies. I do not want to give people a hammer thinking everything is a nail. I want people to struggle, to think, come up with their own ideas, and enjoy the process of intellectual engagement. Authors offer case studies because people want cookie cutters. Instead, I suggest to people that they think about discovering fire; making a chisel, bow and arrow; developing their own tools to solve problems innovatively; developing innovative solutions to tackle problems around; or making human life more enjoyable, safe, productive and healthy. I have taught people from many countries, with varying proficiency of English, for eight semesters at the IIT School of Applied Technology, Chicago. Training minds to be innovative is not language dependent and doesn't require laborious studies of case studies. I have loved every student's innovative ideas and solutions to challenges I pose to them. My course final is a project to innovate something in two hours, and students love the final. Similarly, I didn't include case studies in Business Innovation. My interest was to capture the fundamentals of innovation and make it available to everyone. I don't want people to buy my book because company X or Y has applied my ideas. I want people to explore the breakthrough innovation framework in their ways if they are determined to learn something different, agree with the logic behind my framework, and want to practice it. VB: You say, "Once people accept that innovation is a result of the discovery process, not a subconscious effort, the process of innovation can be easily understood and established as a predictable system." Does this mean Edison was correct when he said genius is 99% perspiration? Praveen Gupta: People have been led to believe that creativity and innovation results from a flash of genius. Some are destined to receive such flashes while others are not so fortunate. One of our first challenges is to get people to understand that they are equally capable of being creative or innovative as everybody else. This can be done by showing them that there are biological similarities among all of us. We present a logical case to readers of Business Innovation, and to people attending our seminars and workshops, that everyone has the similar potential to be innovators. Conventionally people are trained in creativity. Instead, we help people become faster innovators rather than remain bogged down by the creativity myth about flashes of genius. Every innovation has its predecessor. Therefore, innovation depends upon the ability to understand the prior art, evaluating potential needs, and then developing an innovative solution. We have learned that innovation is a direct function of effort. Without any effort there can be no innovation. Therefore, Edison was right when he said genius is 99% perspiration. We often hear that ideas are a dime a dozen. Innovation is about taking a good idea and developing it into a marketable and profitable solution. It takes a lot of perspiration to turn creativity into innovation. VB: "In the knowledge age... if time is not spent pursuing creativity, organizations will not survive. Letting a company collapse is an awful way to free up one's calendar." It is that critical? Praveen Gupta: For most businesses, innovation is a critical competency for survival in a globally competitive environment. We do not even know where in the world the competition will come from. The competition could come from an individual or company in a geographically remote part of the world. Often leadership tunes out employees' voices. Instead, the leaders tend to make most of the decisions rather than listening to their employees. Corporations hire educated and experienced people to work for them, and then tell them to perform without giving them time to think. As a result people are busy, but the results may remain questionable. Employees are working harder than ever but they often are more disengaged intellectually. Corporations say employees are assets but treat them as liabilities. When corporations are managed for financial turnaround, they typically recruit financial, legal and operational professionals whose first focus is on headcount reduction. Instead, they should be engaging the minds of their employees to revive the company. It is appalling that company after company struggling to survive and turn a profit ignores its intellectual capital which has the fastest cycle time and highest return on investment. Instead, they perpetuate ineffective strategies to their death. It has been said that it is a crime for an executive to waste society's valuable resources by directing them at unproductive uses. VB: "…understanding the new paradigm in the language of the old paradigm is virtually impossible….The new paradigm is realized as a result of taking action. Innovation must be enacted into reality, and explanation will follow." Is this the case because so many people are naysayers when considering new ideas? Praveen Gupta: When someone in a meeting makes a suggestion the leader of the group may think ideas are a dime a dozen. It's all about the implementation of idea. This response seems to assume that the person with the idea doesn't have any clues about implementation. Such verbal or nonverbal reactions give the message that ideas are not welcome, resulting in disengaged employees. Leaders must realize that it takes hundreds of ideas to generate the right idea for a useful solution. Therefore employees must intellectually engage continuously to think of new ideas in order for one or a few to emerge that will result in revenue or profit opportunities. The new paradigm that innovation can be a learned skill is still hard for many to believe. They still think that people are either innately innovative or not. In the absence of a well-understood innovation framework and uncertainty associated with the ability to teach innovation to other people, myths persist that a great corporation can only be built by hiring great or innovative people. The Brinnovation™ framework we have developed allows anyone to recognize one's potential, acquire innovation skills, and pursue one's passion. This enables corporations to realize the potential of their existing employees rather than thinking they have to hire new employees in order to generate and implement new ideas for profitable growth. We need to remind ourselves that everyone has been innovative one time or another, in their personal if not in their business lives. The need is for them to be innovative all the time or on demand. This means they need to learn a reliable and holistic model for conceiving ideas, being innovative, and turning new ideas into reality and action. VB: "Words either describe the facts or distort them, and facts are always non-verbal." Does describing the facts require creative thinking? Praveen Gupta: It is not the description of facts that helps with innovating new solutions. Instead, interpreting facts in the context of targeted innovation or manipulating facts to create a new idea could lead to innovation. In the information age, facts are an objects or items that can be combined uniquely to generate new ideas. Instead of describing, utilizing facts would require creative thinking. VB: "Listening for comprehension requires that listening is active, attentive, reflective, empathetic, and searching." Is developing the ability to listen the core skill for the three main methods of innovation you identify – collaboration, networking, and brainstorming? Praveen Gupta: Listening is a great skill for creating new knowledge or an innovative solution. It is a sense that feeds the brain's continuous creative process. One can touch, hear, see or feel to learn something different and contribute to the associative process in the brain. It may not be a coincidence that when the economy was growing in the 1980s more companies were training employees in listening skills. When the economy is cost conscious, more companies train employees in presentation skills. This apparent correlation may have nothing to do with the cause of the shift from a growth to a profit focus in economy. Listening is as important as visually observing for insights to enable innovation, be it collaborating, networking or brainstorming. VB: You said in "The New Paradigm" it is hard for many people to believe that innovation can be a learned skill. Praveen Gupta: It is. It's hard for some people to believe that somebody can teach them how to be innovative. The literature talks about creativity, but nobody offers a complete, integrated, and comprehensive analysis of the field of innovation. This is what we're trying to do. VB: "Creativity is not a spectator sport." Would you agree that in the business world too often the focus is on ideas and analysis, and not enough on action? Praveen Gupta: Both are critical. A lot of leaders trivialize the creativity part by assuming that ideas are a dime a dozen. When they tell this to their employees it's very disheartening for them. It says, "Don't give me new ideas." So then the question is what else should employees offer that will make a difference for the long term profitability of the company? You can't develop a solution before you come up with new ideas, which means creativity is a prerequisite for innovation. Ideas are required in orders of magnitude so that innovative solutions can arise. Without creativity, without ideas, there is no foundation for innovation. This is one of the reasons there are so many entrepreneurship centers around the world that do not deliver the results they are supposed to provide. They are preoccupied with earning enough to pay for their offices, but they are not creating new jobs. VB: If they are only earning enough to pay for their offices, what are they doing? Praveen Gupta: They are teaching entrepreneurship without innovation. It is like applying a scorecard management system without intelligence, or giving you a car without an engine. VB: "Software is and will be at the core of most disruptive innovations during the next several decades." Does this apply equally to companies that produce products or provide services? Praveen Gupta: Software is becoming like information. What does software mean? It is the processing of information, and it's an integral part of all innovations. If anything, software accelerates innovation because now there is so much information available creating so many new combinations. VB: Would you describe one or two companies that have mastered internationalization of R&D activities, including the use of people with diverse cultural backgrounds to stimulate lateral thinking? Praveen Gupta: Many large companies have internationalized their R&D activities, but the issue is whether it is efficient. The companies that have internationalized their R&D activities tend to be the big brands like the often cited Proctor and Gamble. It has globalized its innovation process, and has done a good job of standardizing the innovation process. IBM is also trying to standardize its innovation processes and services. G.E. has done it differently. GE is outsourcing or off-shoring its innovation processes to countries like India. Maybe in these countries more bodies can be deployed to work on innovation because of lower costs. This does not appear to be a sound solution because results still show that the effectiveness of the innovation process, no matter where you do it, is 5-6%. By merely moving innovation work someplace else doesn't make it better or faster. It may make it cheaper because of the current state of these emerging economies, but still the issue is how you make the innovation process more effective, more productive, and a better investment. VB: There are a lot of challenges in off-shoring innovation, aren't there? Praveen Gupta: Absolutely, just like any other process, there's the potential for huge problems. Large companies can justify off-shoring by considering that for every employee in developed economies they can afford four in developing economies. They may feel happy about getting a small incremental gain, but it is a waste of resources in the global context. VB: How do you mean it is a waste of resources? Praveen Gupta: We are not utilizing the full potential of the four or five people in the developing economy. It is interesting that everyone talks about innovation, but few in large corporations, universities, or academia are focused on developing the science of innovation. At Accelper Consulting, we are committed to doing this because we see there's an opportunity and benefit in developing the science of innovation. It is somewhat like industrializing innovation using intellectual processes. The question is how do you standardize intellectual processes? The processes have to be developed, and mature. VB: Are the universities and business colleges failing to provide their students with adequate innovation skills? Praveen Gupta: They are teaching their students entrepreneurship which means they make them successful business people. When they graduate they can become good traders; they can successfully trade information. But they are not creating new wealth or jobs as needed. There is a huge opportunity for individuals anywhere in the world to create something new in this information and knowledge age. VB: By definition, though, isn't entrepreneurship the equivalent of being innovative in today's world? Praveen Gupta: I'm not convinced that a lot of entrepreneurs see innovation as a key goal, and even if they do they may not have the tools to accomplish it effectively. Their focus is on the traditional things in business, such as finance and marketing. Bob Galvin, who was Motorola founder's son, its Chairman, and an exemplary leader, said when he was a student his professor asked him, "Can you think of some creative ideas?" He observed that nobody was teaching them how to think creatively. It's sad because successful entrepreneurship is contingent on innovative solutions – maybe not all the time, but most times. I was at a conference on entrepreneurship, where people were presenting success stories. They talked about two newly launched businesses: one a hair salon and the second a drycleaner. I couldn't help but wonder how many drycleaners and hair salons could America afford? We need to do something better in this information economy. VB: Innovation can be learned. Praveen Gupta: It can be learned, absolutely. It can be learned rather quickly. VB: You talk about the "colossal capability of the brain." Are many of us limited in our creativity and innovation abilities because we don't believe in the full ability of our brains? Praveen Gupta: We have been led to believe we are not creative. Throughout our education we are primarily taught reproductive thinking, not productive thinking. We are taught to earn grades; not to learn concepts. In a figurative sense, we learn how to use a hammer, but we don't learn what else we can do with the hammer. We learn everything as a cookie-cutter but not that we can use the cookie cutter to do something else. VB: This method of education has long historical roots. Praveen Gupta: Isn't it amazing? We're teaching with historical information. We're teaching them what has been done and reproduced over and over. We are not teaching students to create new knowledge. Some of those lessons are needed. We need to teach people how to produce. VB: Learning how to memorize doesn't necessarily help you learn how to create and produce. Praveen Gupta: Memory is a good reproduction method, but using both the left hemisphere and the right hemisphere is critical to creating new solutions. VB: "Learning minds tend to be more innovative." Is that because the brain is then more active and focused? Praveen Gupta: The brain is continually working, whether you know it or not. Even when you are asleep your brain is working. And the process of your brain is associating different objects you have seen throughout your life. If you see somebody after a long time, right away either the brain has a memory associated with this person, or it doesn't. If your brain associates the person with an event, smell, location, or other experience then you realize that you know this person. And if the brain doesn't recognize the association, or if the image is fuzzy, then you won't remember the person. The brain is always associating and comparing things, and creating patterns. The learning brain creates more opportunities for more associations. It's like the brain is continually experimenting. Einstein said there is nothing invented. It is all discovered. Whatever we are discovering already exists in some form, so he called it ‘combinatorial play.' The brain is always combining things. VB: Some people do meditation, chanting, yoga, or engage in other activities to empty their mind for focused thinking, to be present, for a period of time. Is this beneficial in helping us be creative? Praveen Gupta: We don't want a blank mind. Then your brain won't be doing associations. It would be like a newborn child. We have experiences and we don't want to erase them. Phil Jackson, former coach of the Chicago Bulls and currently that of the Los Angeles Lakers, said in Sacred Hoops we need to clear our brain and open our mind. He uses lessons from Zen Buddhism, the ways of the Lakota Sioux, and alternative styles of coaching including team meditation sessions. When you do meditation, you basically clear the clog in the drain so that your brain opens up. We still have to use experience but we don't want to be clogged and blocked by the current disturbance that is going on in the brain. And that is, in my opinion, what meditation is doing. It's calming your brain down so you can use it effectively. VB: Meditation should be beneficial for creativity and innovation? Praveen Gupta: We have learned in the world of innovation and the study of the brain that we should always do something that does not disturb our peace of mind. As soon as you destroy your peace of mind, you stop thinking and are more inclined to be defending and blocking. We should always strive for peace of mind. VB: What is peace of mind? Praveen Gupta: Peace of mind is a state of no disturbance. It is more like equanimity; you take things as they come rather than worrying and being agitated about something, and expecting more than what you're going to get. If you become agitated you use energy for something that's not going to produce positive results. VB: What is "innovation on demand?" Praveen Gupta: This is a very powerful concept. Currently most large corporations have R&D departments that are innovating, but statistics show that the success rate of the products they develop is very low – 5 to 6%. My question is when your design process is only 5 to 6% successful, how can you expect perfection in manufacturing? It's like trying to make a clear print from a fuzzy negative, from an old technology. You cannot do it. There are two sides to innovations. R&D driven innovation is where you focus on creating a market and the success rate is very low. Demand-driven is where you create the innovative solution on demand and deliver it. Demand-driven innovation gives you the opportunity but you have to be agile, and deliver on time. The challenge is that you have to be fast. If you are slow and it takes 10 years to develop a solution on demand, you've lost the opportunity. That's why I use the analogy that all of us know how to walk, but a few of us jog, even the fewer run, and a very few race. But when you race you have to train for the race. It is the same thing with innovation. Everybody is born creative. Everybody has the potential to be an innovator. But we are all inefficient because we don't know how to streamline the innovation process. We haven't learned the skills. As described in Business Innovation, we have designed a process to enable people to innovate on demand based on what they see as an opportunity. We have spent time streamlining the innovation process so we can become faster at developing innovative solutions on demand. VB: "On-demand" is driven by seeing the opportunity? We are in an age of mass-customization. Although this doesn't apply to all innovations, we increasingly want something that is unique to us. Products are becoming more and more personalized. In order for our solutions to be personalized we have to innovate on demand. We have divided innovation into four categories called the Portfolio of Innovations. The four categories are "fundamental," "platform," "derivative" and "variation." This helps in classifying what could be developed on demand, and what could take more time and perhaps be R&D driven. Fundamental innovations are creative ideas leading to a revolution in our thinking. They are based on extensive research, are knowledge driven, and contribute to human evolution. Examples are Einstein's Theory of Relativity, the telephone, computer software, the Internet, the Fractal, and penicillin. Platform innovations lead to the practical application of fundamental innovations, and are usually the launching pads for a new industry. The personal computer, silicon chips, cellular phones, digital printers, Web technology, and satellites are examples. Derivative innovations are a secondary product or service derived from Platform innovations. They are slight modifications of the main product. An example related to a satellite system is launching options or capabilities users are offered. Variation innovations are next-level products or services based on the use of derivative or platform innovations. Various applications developed by users based on the Microsoft platform are examples. This type of innovation often occurs close to the customer and is personalized. VB: Creativity and innovation requires a lot of structure and rational thought. Praveen Gupta: Just like our brains. If you ask a scientist today, "Do you know all about the brain?" he or she would say, "No." But at the same time we understand some aspects of the brain at a high level, and even at a moderate level. But we don't understand enough at the neuron level. It is the same way with creativity. We cannot structure every single idea but we can create a framework and work within that framework. This framework can be aligned with the brain. VB: "…innovation on demand requires purposeful imagination…" If "purposeful" isn't present is there a danger of limiting creative thought? Praveen Gupta: This goes back to the question, ‘What is creativity?' I came up with the simplest definition. Creativity is combining two or more things uniquely. In order to achieve innovation on demand we need to understand that creativity is simple to learn. The first lesson people need to learn is that creativity is not a flash of genius. It is combining two or more things differently. You can look at any solution, any creative idea – that's how it is formed. When people become good at combining things, they become good at being creative. To answer your question, purposeful imagination is focusing creativity. When you ask people to imagine something they always look at the horizon; they tend to look to the end of the road. We focused on 'business innovation' and defined its boundary. The limits relate to "keeping in mind the business strategy," which means sustaining profitable growth. We need to innovate to achieve profitable growth year after year. The question is how much do we need to innovate? Breakthrough innovation doesn't mean we have to radically change the world. Purposeful innovation refers to how it meets the purpose of the business and contributes to profitable growth, rather than doing innovation at random which often nobody can use. VB: You say innovation creating demand is slow paced and R&D driven, while innovation on demand must be organization-wide and fast. Do you consider disruptive innovation most often to be "innovation on demand," and therefore needing to be fast paced? Praveen Gupta: The question is how can you speed up innovation creating demand? Sometimes you have to plan what innovations should be undertaken. This is where an understanding of the fundamental, platform, derivative and variation types of innovation helps. We've found that innovation is a function of the resources dedicated to it and the speed of thought. In terms of resources, if you put in zero effort you will get zero innovation. If you put in more effort, you will achieve more innovation. It is a very direct correlation. The second part, the speed of thought, includes the speed of processing information in an organization. As an individual I can ask myself what is my speed of thought, how can I measure it, and how can I make it better and faster? Our speed of thought is a function of three things: knowledge, play, and imagination. If you are doing a job without ever having experienced anything related to it, what knowledge would you have? Likely not a whole lot! This tells us that every innovation has its predecessor. There's no innovation coming from outer space. Innovation is an evolutionary process. There was always something before. And that's why the United States Patent and Trademark Office always examines "prior art." If there is no prior art listed, they have a difficult time accepting the proposed innovation. Knowing what has been done determines the extent of your knowledge, your competency, and your expertise. It is critical to being an innovator. And then you need to play. Einstein calls it combinatorial play, or means experimentation. We must be able to tinker with things, to put two or more things together. In the case of information, it is all done in the brain. Einstein's innovations were all thought experiments. He did everything in his brain whereas Edison's were primarily done in his laboratories. The third thing impacting our speed of thought is imagination. Imagination is about how you extend and expand, how you diversify, and how you stretch your thinking. Imagination permits you to create the maximum innovative solution. With this understanding we recognize that fundamental innovations are more knowledge and imagination based. Typically a good recipe for platform innovations is the combination of knowledge, play and imagination. Derivative innovations require a little more play, less knowledge, and less imagination. Variation innovations are pretty much all play, a little bit of imagination, and a little knowledge. If you go to buy a cell phone technicians can innovate for you on demand; they can personalize the phone for you. The people helping you don't have to be knowledgeable about the technology instead they should be able to play with the technology. They can do things to personalize it, such as change the code, ring tone, color of the cover, camera features, and software-based optional features which makes the phone unique for you. That is a variation type of innovation in its simplest form. By understanding the different categories of innovation you will realize that, for example, fundamental innovation creates science and knowledge that can sometimes take fifty years to commercialize. So you would have to allocate resources proportionately. Platform innovations are required, but this doesn't mean every single innovation is this type. If you know that an innovation is needed within the next three months you can intensify the allocation of resources accordingly. In this way, corporations can create a portfolio of innovations. VB: By understanding this, businesses can consciously focus their resources on their desired type of innovation? Praveen Gupta: Yes, absolutely. The fundamental and platform types are for creating demand, and the variation and derivative types would be innovation on-demand. Without this knowledge you may be dedicating all your innovation resources to create demand. It doesn't work well like that. VB: Otherwise innovation activities may be random and done by chance. Praveen Gupta: Absolutely. That's the point. VB: You also say that applying thinking to the innovation process is the first step in developing innovative solutions on demand. Why do some people always seem to have the most creative ideas? Praveen Gupta: With experience they have learned how to be innovative, even without recognizing that they have developed this skill. They are good combiners, and they create new recipes on the fly. They are fast thinkers. For example, when I developed this framework I asked one of my contributors, an individual with 55 registered patents, to comment on the methodology. He said, "That's exactly how I do it because it's how the brain works." The people who have intuitively recognized the innovation process are good at it. This doesn't mean they received it from God. It's learned from their environment, their experiences, and somehow by chance they got it. But I speculate that the percentage who use this process intuitively is small – 2 to 5 %. The beauty of the innovation framework is that the process can be taught. That was the challenge and the goal we wanted to accomplish. VB: People who have been more creative happened to be those who chanced upon the innovation process? Praveen Gupta: Yes, and its why people who are innovative are serially innovative. They know how to create new things. They fail, they try, they fail again, and they try again. Those who have not chanced upon this process may not try again after their first failure. Or they may not try in the first place for fear of failure. They're afraid of being a failure, but failing is not bad. The culture of a firm will become innovative if the leaders and employees understand the innovation process. Educating employees about the innovation process is the first step in the innovation direction. Whenever you want somebody's behavior to change, it's always wise to begin with education. VB: Would you talk about your concept of "Brinnovation™?" Praveen Gupta: "Brinnovation™" is an abbreviation for breakthrough innovation, and the breakthrough is defined by the rule of two. The rule of two says if less is better, if you have to innovate something to make it smaller or lesser, divide by two. At least cut the characteristic into half to set the innovation target. If more is better, then multiply by two. At least double it. The breakthrough innovation makes it visible. If it is different, it better be very different. Don't tell your customers a product or service is different if it doesn't look or operate differently. Breakthrough innovation looks different, feels different and works different. Before 1986 the cell phone industry practically didn't exist. There were some mobile phones that were called AMPS – Advanced Mobile Phone Systems. It came from AT&T Bell Telephone Laboratory in New Jersey. The first generation of mobile phones was backpack sized – they were big. The next generation was more like the size of a brick. After that, the industry started changing 10-15% a year in volume, size, price, and capabilities. Somebody at Motorola said, "Let's surprise the competition by making a 50% improvement." This challenge forced Motorola's researchers and engineers to do something radically different. It led to developing something exciting, the flip phone which launched the cell phone industry. At one point, Motorola had the dominant market share in the number of analog phones. And when digital technology evolved Motorola ignored it while Nokia exploited it. Motorola started suffering. After suffering for a while, not knowing how to regain market share, somebody suggested to do the same thing as the last time. The challenge was to come up with an innovation that would provide a 50% leap forward in features or cost. Motorola took Nokia's candy-like phone, a phone being sold for about $39, cut its thickness in half and that launched the Razr cell phone. The Razr was priced significantly higher than the existing product in the marketplace. At the time it was around $600 compared with $40 for its competition. We have to keep in mind that the first generation of cell phones cost about $3000, and people even bought them at this high price and Motorola could not make enough of them. People willingly pay premium for innovative products. Steve Jobs has mastered this process. He says it is not the new technology; it's the use for the new technology that makes it innovative – a new recipe, a new combination. He familiarized with Sony and Motorola technology, and then designed the iPod sound music market, the phone market, and the computer market. Steve Jobs knows the innovation process, but that doesn't mean everybody in the company has mastered the process. It is the challenge Apple experienced when he previously left the company. VB: The secret is to make quantum leaps in innovation. The rule of two is a minimum? Let's use the example of iPod. The predecessor to the iPod was Sony's Walkman. The Walkman was about 4 inches by 4 inches in size because it used CD's. About 8 to 10 songs are recorded on a CD, with one or two of them being good songs in the view of the user. The user had to pay $10 to $15 dollars for CD's, and the Walkman itself cost about $70. Today, iPod offers a significant reduction in size – about 80%. It also offers a quantum increase in storage capacity, an increase from 10 songs on a CD to almost unlimited storage – 1000's of songs. Not only 1000's of songs, but all of them your favorite songs, songs you've chosen based on your personal taste. Not only this, the price per song for your favorite songs is reduced from 8 or 9 dollars down to 99 cents. With the iPod, Apple certainly exceeded the rule of two in terms of a break-through innovation. VB: You say in our knowledge age, with pervasive access to the Internet, the building block of innovation is a networked individual. Does this mean large corporations will become less able to achieve disruptive innovation than individuals collaborating online? Praveen Gupta: It's similar to when we are growing up as individuals. We go to college, and we are part of the structure. We are told how to learn and what to do. When working in a corporation we learn the corporate system. It teaches us rules and boundaries to follow rather than providing rules and boundaries to guide us. There is a big difference. Corporations pay a price for their success. They create a structure that is limiting because they want to protect their recipe for success. They want to protect what made them big. They are afraid to change because they were successful and grew luckily, and they don't know when the next chance for growth will occur. By knowing the innovation process and having a portfolio for innovation, corporations can be continually innovative for a long time. It doesn't matter whether they are large or small. VB: Being big makes it harder to be flexible and fast afoot. Praveen Gupta: This was the case in the last century of materials and machines. In today's age, with the Internet and the ability to be fully connected and virtually located, corporations don't have to be so rigid in their operations. They can now be flexible, at least in an intellectual sense. Today innovation is significantly dependent on intellectual capabilities. Using employees' intellectual capability doesn't require a change in the physical structure of firms, but they can empower and listen to their people. It requires recognizing that times have changed. The 21st century is different from the 20th century. It is very different. This is a virtual century with knowledge economies while the 20th was a physical century. Once corporate leaders recognize this change they will be happy to liberate their employees to think in unlimited ways. VB: How will understanding your "Gupta's Einsteinian Theory of Innovation" help us to better understand innovation and improve our innovation capabilities? Praveen Gupta: I developed it when I was developing the innovation framework. There is a story behind it. As I said earlier, I had the opportunity to work with the inventor of Six Sigma, the late Bill Smith. My job was to make it work at Motorola in '86. I undertook to make Six Sigma better in 2004, so I applied the theory of constraints to the Six Sigma processes. Through this I learned that innovative thinking is a required skill to make Six Sigma successful. So then the question was how to teach innovative thinking to people. In response, I set a goal of learning from among the best innovators. I selected five: Albert Einstein, Thomas Edison, Sir Isaac Newton, Galileo Galilee, and Henry Ford. I had been studying Einstein's thinking process for a while and was impressed. He's a role model for thinking ‘BIG.' Einstein said that you should simplify until it can't be simplified further. As I was developing the methodology for innovation based on my experience, I discovered that there are so many consultants, methodologies, and frameworks related to innovation. How do you know which ones are right, and which to adopt and follow? From a systems point of view I decided I had to go above the level of methodology, have a better understanding of the process of innovation, and create a framework. Now here's the story. In my undergraduate program we had a course called ‘Direct Energy Conversion,' which appeared so irrelevant at the time I had no idea why they were teaching it to us. While developing the innovation framework based on the undergraduate course it occurred to me that ultimately we all are energy converters. Everything in life is energy conversion, period. While developing the innovation framework I flew to Boston to see Einstein's exhibits in the Museum of Science. I spent over 4 hours and was struck by his equation related to special relativity, E = mc2. While at the museum it occurred to me that I might be able to use Einstein's framework, which he had used so thoughtfully. I tried to equate the process of how you convert energy to the process of thinking. The formula E = mc2 is an energy conversion equation. It's about converting energy (E) to mass (m), with 'c' being a constant – the speed of light. And in the case of innovation we are talking about the speed of thought. So what is the difference between the speed of light and of thought? For the speed of thought to be of a similar magnitude as the speed of light, you must have prior experience. Suppose you travel to the sun and take note of how many miles away it is. If upon returning you decide you want to go back to the sun in your mind how long will it take? Almost instantaneously! This suggested to me that the speed of light and thought are indeed somewhat comparable. It was a good starting point for considering this equation. In place of Einstein's special relativity formula, the formula regarding thought is: Innovation is equal to Effort times the Speed of Thought2. Speed of thought is a function of knowledge, play and imagination. This is a simple model for putting a stake in the ground to launch systemic approach to understanding the innovation process. Research opportunities exist to better understand and to fine tune the formula but it does seem to work. The Einsteinian Theory of Innovation indicates that our innovation capability is a function of effort times our speed of thinking at both the individual level and at the corporate level. It is resources times the speed of processing information. In the Information Age, it means that the more we can process information, the more we can do combinatorial play. There are so many variables, so many possibilities. I have learned that HP has developed a product to automate innovation. We also plan to develop the software that can accelerate innovation by orders of magnitude. We believe it can be mechanized to a great extent. Einstein said that unless something sounds absurd in the beginning it must not be innovative enough. We are endeavoring to create a very different paradigm compared to the common wisdom with the aim of creating a new field, a new approach to innovation. VB: With practice can we change our speed of thought and, if so, would it be of benefit? I'll give you an example. If at a meeting there is a question about plastics, who will be the most likely person to answer the question the fastest? It'll likely be someone who works in plastics. An expert in certain types of metals likely won't know much about plastics. Knowledge and experience make us think faster. This is why the learning mind is so critical. The learning mind enables us to become fast thinkers, because we are able to create more options. An option is another unique combination. When you are driving in a large city for the first time you have to follow the signs and stick to the main routes, even if the traffic is heavy. This happened to me in the New Jersey area about 1 am in the morning when suddenly there was an accident that caused a traffic jam. The road was like a parking lot. I had no idea of the local road network so I had to stay on the highway. A local resident would have taken an alternate road because of the familiarity with the township. This illustrates that knowledge makes you faster in the circumstances when you have to innovate something new. The speed of thought can be affected by experience and education. VB: And education equates somewhat to knowledge? Praveen Gupta: Education helps you learn more, and so does experience. Fast creative thinking means you are continuously combining. You have to practice to become a continuous combiner. The more you learn the more you combine. One of the questions I ask people is, "Do you purposefully use your prior experience?" Many don't. They don't recognize how many experiences they have had, and how to use the past experience to create new things. By learning the innovation process they can do so. They can go back to the library of their experience and create new things. Vern's note: We will continue with our interview with Praveen Gupta in next week's IdeaConnection newsletter. We will explore his idea that funny ideas are more innovative than good ideas, play and having fun encourage innovation, motivating employees to innovate for profitable growth, measuring innovation in a company, how to raise children so they will be innovative as adults, and much more. 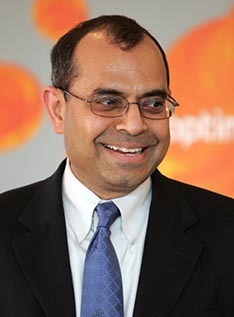 Praveen Gupta has a Bachelor of Science in Electronics and Communication from IIT Roorkee, India, and a Master of Science in Electrical and Computer Engineering from the Illinois Institute of Technology in Chicago. He is President of Accelper Consulting and for over 25 years has worked with companies to achieve sustained profitable growth. He is a frequent speaker at conferences and special events. He developed Brinnovation™ for accelerating innovation, the 4P model for achieving process excellence (Prepare, Perform, Perfect, and Progress), a Six Sigma Business Scorecard for measuring corporate performance, and the Corporate Sigma for monitoring Six Sigma initiatives. Praveen Gupta is the author of Business Innovation In the 21st Century: A Comprehensive Approach to Institutionalize Business Innovation (2007), ISO 9000: 2000 An Implementation Guide (2006), The Six Sigma Performance Handbook (2004), and Six Sigma Business Scorecard: A Comprehensive Corporate Performance Scorecard (2003). He is also co-author of Stat Free Six Sigma (2007), Improving Healthcare Quality and Cost with Six Sigma (2007), Six Sigma for Transactions and Service (2004), The Six Sigma Black Belt Handbook (2004), Six Sigma Business Scorecard: Creating a Comprehensive Corporate Performance Measurement System (2003), and Six Sigma Deployment (2002). His published articles include "Innovation: The Key to a Successful Project" (Six Sigma Forum Magazine, August 2005), and "Innovation and Six Sigma" (http://www.qualitydigest.com, December 2004). An abridged version of Business Innovation titled The Innovation Solution will soon be published.